"One thousand years ago, the great Kami Dragon was summoned to grant a single terrible wish—and the land of Iwagoto was plunged into an age of darkness and chaos. With an army of demons at her heels and the unlikeliest of allies at her side, Yumeko’s secrets are more than a matter of life or death. They are the key to the fate of the world itself." It’s been a while since I’ve read a Julie Kagawa book and there is just something about her stories that really make for a good ride. She really crafts a great world with such a great cast of characters. Yumeko is a great heroine. She is smart and strong and when her world is turned upside down, she rises to the challenge. What I love about her is she knows her strength and she knows her weaknesses and she plays to her strengths. I also loved her willingness to see good everywhere. She views the world through a very different lens because of her upbringing and while some see this as one of her weaknesses, I think it’s one of her greatest strengths. Then there is Kage. Kage is so broody and naturally I loved him all the more for it. Kage is responsible for a demon sword and it requires constant concentration. So naturally he is super broody. For anyone who has read The Iron King series and thought Ash was broody, Kage leaves Ash in the dust in the brood department. With Kage’s constant brooding and Yumeko’s constant optimism, it’s a fun dynamic. And of course I loved the secondary cast, especially Okame. I will say that the plot can be a bit formulaic. It’s a lot of travel, fight a monster, travel again, fight another monster, rinse and repeat. But even with that, its engrossing. And the end really brought it! So much was put into motion and it has me dying for answers. I feel like this book was a lot of set up for crazy to come. 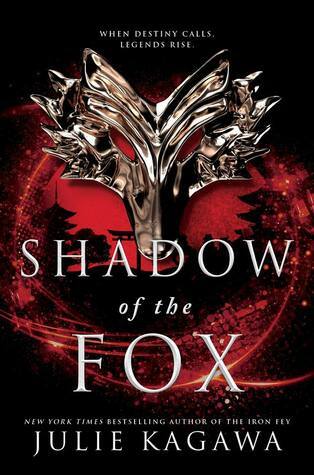 Shadow Of The Fox was a promising start to the series and I look forward to more. That ending has me dying for more and I have so many questions and I can’t wait for answers.